Lonidamine (LND) is a drug that interferes with energy metabolism of cancer cells. In such way LND impairs energy-requiring processes, as recovery from potentially lethal damage, induced by radiotherapy, hyperthermia and some cytotoxic drugs. Its activity appears interesting enough to suggest clinical studies on its potentially radio-enhancing effect. 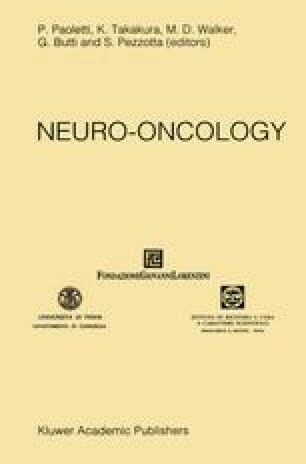 A randomized study started in November 1983, to evaluate the activity of LND in association with radiotherapy as first line treatment in malignant gliomas, after surgical procedure. LND was also used in association with Lomustine (CCNU) at the moment of documented clinical and neuroradiological recurrence. Present preliminary results are described.